Welcome back to Get Empowered! In our last tip-of-the-week blog for Empower Software, we learned how to save extracted channels after 3D data processing (Tip 67). This week we will begin a multi-part discussion about the System Suitability option in Empower. Statistical moments are mathematical ways of evaluating peak shape. Some chromatography data systems, including Empower CDS, make these calculations so that you can compare results across different systems. Let me show you how it is done. We begin by bringing a Sample Set into Review, open a Processing Method, and Integrate/Calibrate or Integrate/Quantitate a channel (Figure 1). Go to the Processing Method window, click the Suitability tab, and look towards the bottom of the screen. There you will find the Calculate Peak Statistical Moments check box. Check the box (Figure 2). Return to the Main Window, and click Integrate/Calibrate or Integrate/Quantitate. The Statistical Moments are hidden peak fields. Go to the Table Properties and scroll down to locate the fields (Figure 3). Remove the check marks next to the fields and click OK. The Statistical Moments are now visible in the Peaks table (Figure 4). The Zeroth Moment is equal to peak area. The First Moment is a measure of the center of gravity of the peak. If the First Moment equals the retention time of the peak, the peak is a Gaussian or symmetrical. If the First Moment is less than the retention time, the peak is fronting. If it is greater than the retention time it is tailing. The First and Second Moments can be used to calculate plate count. The Third Moment is a measure of the vertical symmetry or skew of the peak. If the Third Moment is equal to 0, the peak is Gaussian or symmetrical. If the Third Moment is negative, the peak is fronting. If the Third Moment is positive, it is tailing. The Fourth Moment is a measure of vertical flattening or stretching of the peak. If the Fourth Moment is equal to 0, the peak is Gaussian or symmetrical. If the Fourth Moment is negative, the peak is flattened or compressed. If the Fourth Moment is positive it is stretched or taller. For example, the first peak has a USP Tailing of 1.0 and the First and Third Moments indicate a Gaussian peak. The second peak has a USP Tailing of 1.3 and the First and Third Moments indicate a tailing peak. For reference please see: The Essence of Chromatography by Colin F. Poole, pages 49-50. Copyright date is 2003. You need to have Empower 3 FR2, SR2 or higher to use this feature. This procedure can be followed using the QuickStart or Pro interface. 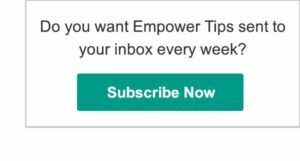 Do you want Empower Tips sent to your inbox every week? Questions? Tips of your own? Let us know!